flowers, landscape, animals, Australian flora and fauna. and also in metropolitan Sydney and NSW country areas. of the techniques of Chinese Painting. "Footsteps of the Dance" and "Rhythm of the River"
category of the Chinese Art. 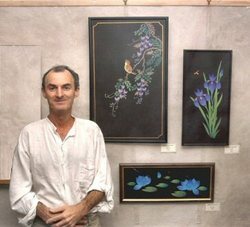 He regularly exhibits and sells his work in a variety of places and operates from the Morning Lake Studio, on beautiful Lake Macquarie. Having studied Chinese brush painting for over 34 years, and taught in Adult Education for over 28 years, he teaches the only correspondence course in Chinese painting in Australia. Stephen studied watercolor painting at the National Art School in Sydney before beginning an extensive study of Chinese Painting. 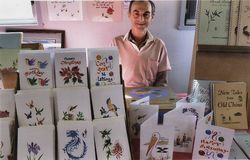 He studied Chinese Painting with Amy Huang for 7 years.